UK sports and fitness outfitters Sweaty Betty produce really rather lovely workout clothing (despite the somewhat unfortunate name) and seeing as I’m far more interested in dressing up for activities than I am for going out, I’ve long been up for trying some to see how the quality compares to the aesthetic. The team recently sent over the Zoom Tri Top and Zoom Tri Shorts, designed for Triathlon (funnily enough!) for me to test out on the bike and in the sea. I waited for a some lovely hot days before jumping on my bicycle and going for a spin in the name of research. It’s a hard life sometimes…. First impressions were excellent – Sweaty Betty have a fashion forward aesthetic and pay attention to all the little details, so their clothes can feel quite special. The Zoom Tri Top and shorts are quite girly and pretty, and I’ll hold my hands up and say that I like things that make me feel nice. The cut of the top is great across the chest and shoulders and overall the fit is good apart from a hint of bagginess at the bottom on the front – it’s a tiny bit large and sticks out very slightly rather than hugging the body. Nonetheless, it’s very flattering piece with the patterned side panels lending a curvy silhouette. On it’s own, I’m none too crazy about said pattern but I’ll concede that it works well as a contrast to the black and turquoise panels and coral pink zip pull. I chose a Small, and unlike so many other brands, it actually is small, which I like. If you’ve got any body hangups or prefer a bit of leeway, you might prefer to size up… but then again, maybe don’t because we all know baggy lycra looks rubbish! The concealed zip and laser cut edges look smart, mesh pockets at the rear hold your bits and bobs and silicon grippers on the hem aim to hold the top in place though have trouble doing so as the top is a little big around the bottom. The internal bra is a great feature and the Polyamide fabric lends support and dries quickly. The Zoom Tri Shorts complete the look. The back of the shorts is a quite strong, supportive fabric that offers some compression whilst the sides and front are a more regular quick drying stretchy lycra/polyamide combo. As these are triathlon shorts rather than general cycling shorts, the seat pad is extremely slim to allow it to dry quickly, making these shorts ideal for the aforementioned triathlon and also for spinning class or shorter more leisurely rides. I found the fit good. The Silicon grippers around the hems did indeed hold the legs in place and I thought the small mesh pockets at the back of the shorts were a nice touch, though what on earth are you taking on your ride if you need pockets in the shorts AND the top? My only gripe – the overlocked stitching on the shorts doesn’t seem the best idea – it’s already gone a little fuzzy in one spot on the inside leg from rubbing on the saddle. 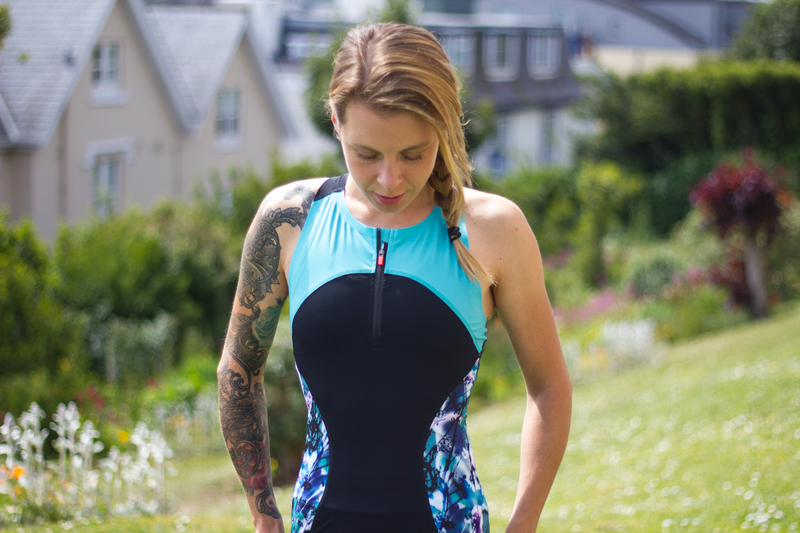 Overall, the Zoom Tri top and shorts would make a great choice for triathlon or spinning, or on it’s own, the top is nice paired with bikini bottoms for a swim or some leggings to go for a run. £65 per item seems reasonable to me, so the kit gets my thumbs up. My girlfriend already have one an a she said its quite nice piece of fitness outfitt. I like how it looks although £65 seems a bit expensive for me. Anyway, nice review! I guess it depends on your perspective – it could be that my opinion of prices has been warped as cycling jerseys can be really expensive!